We have in the past several weeks been looking at the last part of the chapter, the eight “limbs” — integral but subordinate parts of yoga — and most recently, the sixth and seventh limbs, holding (dharana) one’s attention on a chosen object, and meditating (dhyana), wherein one abides for increasingly longer periods of time in attentive presence to and with some object of meditation. I suggested that this was a perfectly fine practice for Holy Week. This last moment in yogic practice (as meditation, though Patanjali has much to say in rest of the third chapter on the fruits of specific focused meditations; the post-Easter topic for another year) is not necessarily a permanent state, since as with the movements of the body in yoga and the quieting of breathing, one must learn to extend this long moment, holding it in place before returning to our ordinary, more fragmentary consciousness. But luckily, one can keep practicing without any urgent deadline to meet. For the sake of yoga in Lent, it is good that Lent comes back year after year. But to conclude on another note: I mentioned last week that samadhi refers not only to this yogic state of advancing meditative practice, but also to the state of the yogi at “death,” when the fluctuations and changes of this life give way permanently and irreversibly to full, quiet, luminous, wise attentiveness. By extension, samadhi refers also to the place where this yogi, who is not cremated, is buried. His or her samadhi is a deep state that is like sleep, like death, and yet too a final extending of the meditation. I write these words on Holy Saturday, just a few hours before the Vigil. Jesus is still in the tomb, dead, descended, not yet risen. It would seem that for the sake of understanding, a deeper understanding, we might consider too that Jesus is asleep, in yogic samadhi, as he lies there in what we call the Holy Sepulcher. Now one might immediately worry that this makes it seem that Jesus did not really die on the cross, it was all a show; we do not want to move in that direction, to be sure, even if the Easter Churches were not afraid to speak of the Dormition of the Virgin. Perhaps we do not yet understand the real death of the person who is truly alive. The samadhi of Jesus in the tomb, awaiting the utterly simple awakening that comes next: resurrection. Thank you for all of this, Fr. Clooney. 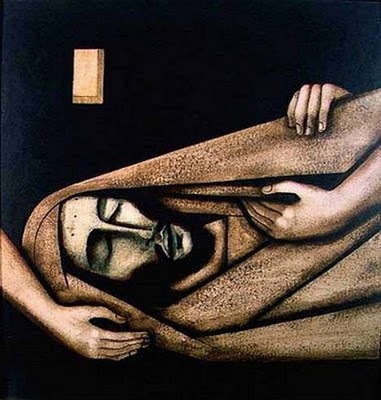 You have given me so much to mull over ... the samadhi of Jesus; the dormition of the virgin ... understanding the real death of someone who is fully alive. I love the words that you have used to define "resurrection", not something extraordinary, but "the utterly simple awakening that comes next".